Did you ever wonder what life was like in America pre-civil war? 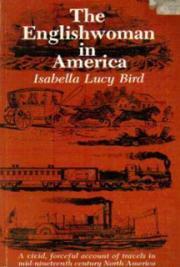 Isabella Bird is a young Englishwoman traveling in the north-eastern United States and Canada in the 1850s. The book is packed with information – every detail of life, traveling, education, industry, medicine, shopping, entertainment, etc. It is written almost textbook style – no character development – she barely mentions traveling companions – but her opinion is in every page. There is nothing politically correct about her, but intelligent, humorous, and observant – a truly great informative read!